David Bowie fever has hit our household. After a ten year break and on his 66th birthday the release of his comeback single Where Are We Now has surprised and pleased the world in equal measure. I live with two musos and there has been much excited chat and Bowie blaring out over the last 24 hours. Accompanying his wistful new single and upcoming album there is an exhibition David Bowie is at the V&A Museum in London, featuring over 300 objects including original costumes, handwritten lyrics and his personal sketches. Now that's something I would love to see. 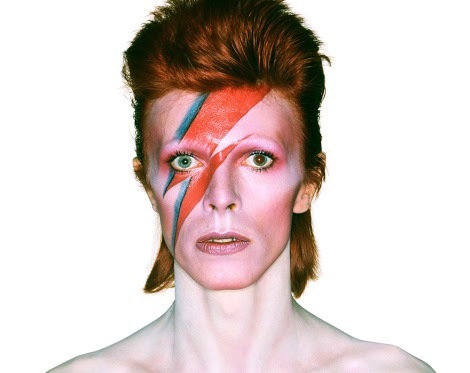 The Beatles of the 70s, timeless in his creativity, cultural style icon and master of reinvention Bowie is a legend. Never one to stand still or be predictable he turned down Danny Boyle's invitation to perform at London 2012, which I think, says a lot about him. Someone dancing to their own beat... that's what I admire. Ooooh David....one of my first great (musical ) loves!! Isn't he amazing? Love that he is as you say Claire "a master of reinvention" and I remember fondly the time I went with my daughter to see him at one of his performances in Sydney. We were so close I could see his different colour eyes! Hope you get to see the exhibition at the V&A - it sounds wonderful.